Commercial construction involves specialized building practices to an increasing extent in today's technologically driven society. Building specialized projects implies construction management techniques are needed to assure that all design details are understood and realized properly. Otherwise, chances are high that the contractor will be pulled in too many unfamiliar directions to keep everything straight. Specialized construction thus enables the building of more complex structures while at the same time forces the general contractor to stretch his knowledge and deepen his expertise. Indeed, it is a paradox for a contractor to be both "general" and "specialized," but this seeming contradiction is only syntactical. The same building skills apply to all projects, but the focus is more concentrated, narrower, and more detailed at the individual project level. Well-managed construction companies develop their specialties according to a carefully crafted business plan. Working exclusively in a single niche market risks sudden obsolescence, while the temptation to tackle everything spreads one too thin. The most successful firms find a happy medium whereby they build on past successes and grow their specialties gradually. This page presents the main areas of construction in which Facility Builders & Erectors (FB&E) specializes. We categorize these specialties primarily by sector and secondarily by the type of construction. Individual items are thus organized accordingly. Let's start by considering construction for the manufacturing sector. The purpose of the factory is to gather together disparate resources to create products. The resources are capital goods, a labor force, and plant equipment. The facility itself is usually an open warehouse-like structure framed in steel with a variety of materials used for cladding and roofing. Designing and erecting the building shell is typically not that challenging, but harmonizing it with the particular manufacturing process at hand can be. The contractor must collaborate closely with owners and architects to ensure that positioning of assembly lines, tools, and infrastructure maximizes efficiency and in no way hinders the flow. A manufacturer outputs either discrete products or continuous materials such as chemicals. Factories for these latter process industries are similar in many respects to commercial and industrial sector buildings. Utilities and companies in telecom, petroleum processing, medicine, and a host of other industries also use warehouse-like structures. However, they aren't always made of steel. Facilities larger than 50,000 square feet are more economically constructed from tilt-up concrete. The diversity found in commercial and industrial undertakings is so broad that the contractor has to be adept at grasping the crux of his customer's processes. The complexity and number of details are so great that he must manage construction rather than just provide it. He has to be prepared to offer additional services regarding design, site preparation, permitting, and risk management. One also finds more interest in building green nowadays. This offers industrial companies incentives in certain circumstances, not only financially but also in terms of goodwill. FB&E is a leader in this area, able to facilitate obtaining LEED certification. Our environmentally friendly outlook has helped us to earn significant business in refuse and recycling construction, another of our specialties. Here, sustainability and renewable resources are of prime importance, and the waste handling processes in this industry have continued to change for the better in step with improving technology. But this means that line equipment has had to adapt and evolve along with it. Buildings that house such equipment must be able to accommodate corresponding changes in workflow. Our flexibility and specialization in high-level management techniques have enabled us to keep up with this evolutionary process and to continue to deliver facilities that meet our customers' needs. Facility Builders is a recognized specialist in the construction and erecting of steel buildings. Other contractors sub with us to gain access to our building expertise here. This specialized skill is one of the main reasons we have excelled in the sectors discussed so far. The same specialization has served us well in building facilities for the aerospace and aviation sector. Constructing hangars in particular is challenging because of the great heights and clear spans involved. Constructability analyses and detailed communication with the customer to determine the most effective design are critical components for achieving success in this area. 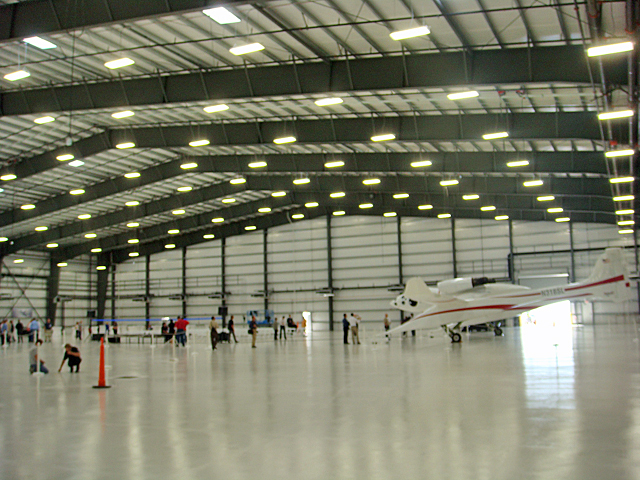 Aviation construction projects also have servicing requirements that go beyond building facilities. Especially around airports, faultless security and safety management is essential. Because we specialize in construction and risk management, we have been well positioned to earn the trust of our customers in this department. Naturally, the same specialized construction management practices have helped us to win building contracts in other sectors for which safety and security are an issue, such as the transportation sector. However, constructing transportation facilities has forced us to expand our specialization to include assisting customers deal with regulation and public oversight. This additional aspect is inherent to much transportation construction, particularly when the owner is a government agency. It should not be surprising then that another FB&E specialty is public works facilities. In fact, many of our strengths come into play for this sector, including construction management; flexibility to handle a wide variety of building projects; smooth facilitation in passing code inspections, environmental impact statements, and other governmental regulations; metal buildings expertise; and strong communication skills. Facility Builders & Erectors is proud to participate in projects like these that benefit the public and greater good. Our leadership in the green building movement, emphasis on sustainability, and environmentally effective management of site conditions all demonstrate this commitment. Such an outlook has also prompted us to specialize in constructing alternative fueling stations. For example, we are a prime contractor in building EV charging stations. Some of these facilities are publicly accessible and others are retrofitted into multi-unit dwellings for limited use by residents or provided by forward-thinking companies for the exclusive benefit of their employees. A similar specialized niche business for us is constructing natural gas filling stations. Compressed natural gas (CNG) is an attractive alternative to gasoline because of the much lower cost. Many transport-oriented companies are converting their vehicle fleets to run on CNG. Hence, a lot of our buildings in this area are for strictly private use, but we also have contracts to build CNG stations accessible to the public. To provide alternative fueling stations often entails remodeling existing facilities to some extent. Such modifications are sometimes necessary to create specialized parking places, to beef up power supply, and/or to individualize billing. This capability ties into yet another one of our specializations, namely, performing office renovations. The challenges here have to do with altering interiors without modifying the building shell and with managing the construction so as not to disrupt ongoing operations. Additionally, in some instances the building owner hires us and in other instances the tenant does. We encourage our early involvement in such projects so that we can consult on planning, budgeting, and constructability review. To summarize, our company has carved out a number of specializations by carefully building on past successes. We genuinely love what we do and strive to deliver the most effective construction solution possible for our customers. We accomplish this by forging close communicative relationships with owners and designers and by attending carefully to details throughout the project. Let us help you find similar satisfaction; call Facility Builders today.